150 ml low fat yoghourt – if it is fat free add 1 tsp oil as otherwise it is to dry. Skin chicken and cut into 8 pieces. In each piece make two deep slashes with a sharp knife to let flavours permeate. Put yoghurt in bowl, with garlic, ginger, tomato puree, lemon juice, ground coriander seeds, garam masala , salt to taste (I don’t out any in!) & 225 ml water. Mix well together and pour over chicken, rub well into cuts and leave at least 3 hrs (or overnight). Heat up oven as hot as possible, put chicken pieces on oiled tray (I use foil on it or that silicon sheet and no oil) Cook fro 15 – 20 minutes until thickest part when pierced has clear not pink juices. Some small blackish bits are fine but don’t let it burn completely. While chicken is cooking mix up salad ingredients and arrange on serving plates. Serve chicken pieces on bed of salad, with lemon wedges to squeeze over. Plain chapattis make a good accompaniment and are also fat free. 180c approx 20 / 30 minutes. I had French vegetarian visitors & this was very popular!!! 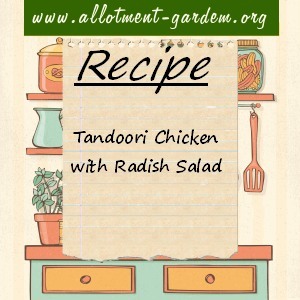 ( Like a Tagine)Just a few ideas for any one growing this vegetable!! !